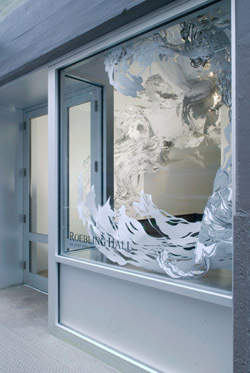 For this exhibition, Pearlman designed a custom wallpaper to line the front window of the Children's Museum of the Arts in New York based on the forms in her installations. 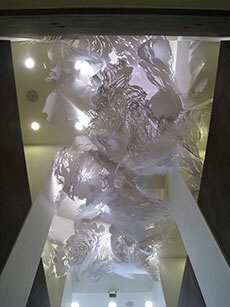 On top of this backdrop is a new cut paper installation evoking a deluge or downpour. 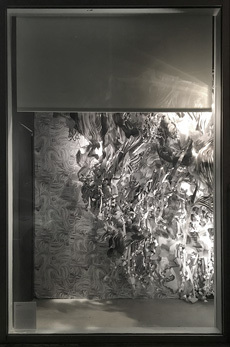 The title of this new work is ERUCTO, from the Latin verb “eructus,” which means to belch up or issue forth violently. It is inspired by the pent up torrent of dark forces in American culture being released in the current political moment. 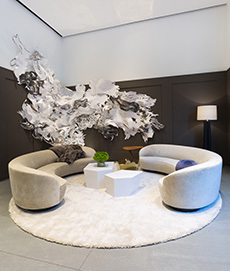 TUMULT was commissioned by Holly Hunt for their NY store in celebration of their acquisition of Vladamir Kagan Furniture. 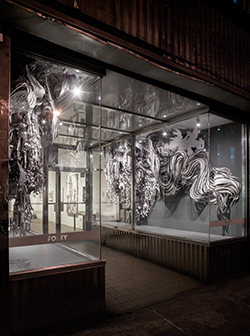 Installed in the large glass window cases of Foley Gallery on New York's Lower East Side, COEVA is made of two facing site specific installations that sweep viewers off the street and into the gallery. Review in The New Yorker: "The best pieces, notably Mia Pearlman’s crashing waves of cut and painted paper in the windows, dig into the connection between creation and destruction." Printemps is a beloved and venerable shopping destination on Paris's Boulevard Haussmann that celebrated its 150th anniversary in March 2015. For their anniversary they invited 11 artists from all over the world to create new artworks in the store's window using their theme, Pantone Rubine red (a shade of hot pink), and flowers. 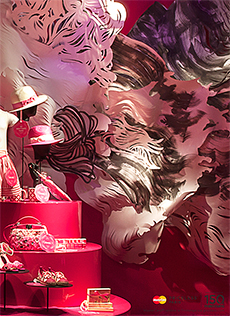 Site specific laser cut paper installation at the Leon Max store in Notting Hill, London. VOLUTA is a limited edition laser cut sculpture made of translucent high impact polystyrene, designed for the Museum of Arts and Design in NY in conjunction with the exhibition "Slash: Paper Under the Knife." 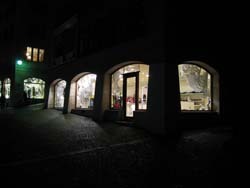 The MAD Store also hosted a window installation. 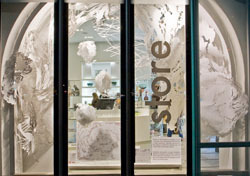 PAPERSTORMS is a site-specific installation at two stores, Septieme Etage and Au Dela du Septieme Etage in Geneva. INFLUX draws people into Roebling Hall from the street, transforming the gallery into a swirling wind tunnel. 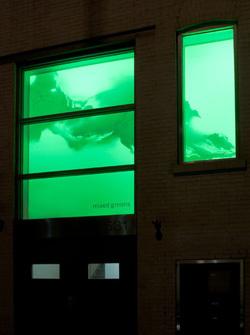 UPDRAFT is a site specific installation in three parts: in the "glow room" windows on the front of the building (at left), on the vestibule glass walls, and in the North gallery.